From 1941 to 1945 Nazi Germany and its collaborators committed the systematic murder of over six million Jews. The Holocaust, also known as the Shoah, was Nazi Germany’s “Final Solution” for eliminating all Jewish people within Nazi Germany’s grasp. By the end of this heinous act, roughly two-thirds of Europe’s Jewish population had been murdered. The United Nations General Assembly’s resolution 60/7 designated International Holocaust Remembrance Day on November 1, 2005, during the 42nd plenary session. Join us on January 27 for International Holocaust Remembrance Day when remember the Nazi’s act of genocide so that no one else will suffer like that again. The United Nations Headquarters unveiled the exhibit "No Child's Play – Remembrance and Beyond" in the Visitors' Lobby. 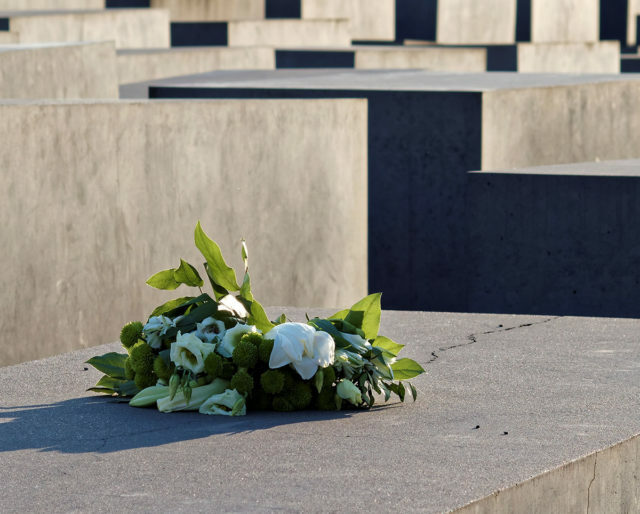 UN General Assembly resolution 60/7 designates International Holocaust Remembrance Day. The Soviet Army liberates the survivors of the last death camp at Auschwitz-Birkenau. Six million Jews are systematically murdered. Holocaust Museums are located throughout the world with several in the U.S. The United States Holocaust Museum is located in the National Mall in Washington D.C. Museums of any kind are valuable parts of any society. Supporting Holocaust Museum with donations helps ensure their important information stays available to all. According to The Blue Card, a nonprofit organization for survivors, one third of the 100,000 survivors in the US live below the poverty line. Any survivor will be elderly and needing help. Give someone a hand and buy them some groceries or fix their fence. Show then the kindness they never knew before. Many of us may be fascinated with purchasing the latest cell phone or learning who a famous Hollywood star is marrying. It's fine to be interested in such things, but we cannot let such trivialities blind us to what evil people do in the world. We must be vigilant. If the horrors of the Holocaust are allowed to fade into the mists of time, they will certainly return to us in the night, threatening us all with doom once more. Edmund Burke famously said, "The only thing necessary for the triumph of evil is for good men to do nothing." The Holocaust wasn't imagined in a single perverse evening of barbarity. History shows the Nazis arrived at the decision to commit genocide slowly, over years. At some point, concerted effort by good people may have stopped them. Watching current events and seeing parallels in the past is how future holocausts may be prevented. Over 6 million Jews died in the Holocaust, but many survived. Remembrance of the Holocaust teaches us that humanity can survive unimaginable horrors. Personal strength and the will to live carried Holocaust survivors on until their rescue at the end of the war. It's a reminder that no evil is more powerful than the human spirit.